Convert video and audio files to iPod formats. Is there a better alternative to iPod Converter? Is iPod Converter really the best app in MP3 category? Will iPod Converter work good on macOS 10.13.4? iPod Converter is a powerful application which can convert video and audio files such as AVI, MPEG, WMV, MOV, MP4, VOB, DivX, XviD, AAC, AC3, MP3, etc. to formats supported by iPod MP4. With this fast and versatile application you can convert video to MP4 for playback on all recent generations of the iPod or other portable MP4 players, iPhone and Apple TV. iPod Converter needs a rating. Be the first to rate this app and get the discussion started! 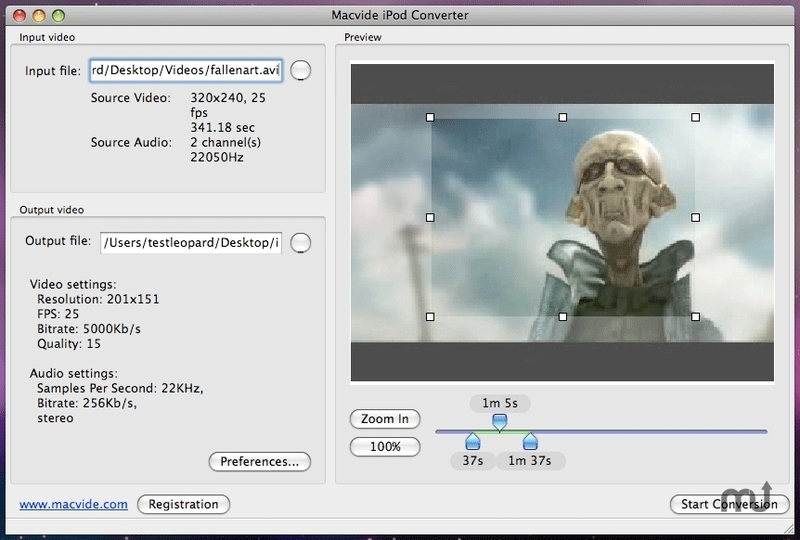 Macvide iPod Converter provides powerful functions to set different settings for your video files. It allows you to select crop video area, the bit rate, frame rate, video resolution. Video preview with "rangebar" allows you to choose the exact video footage you want, anywhere between the first and last frames. With Macvide iPod Converter you will able to convert your entire movie to .MP4 and watch it anywhere and anytime. It's very easy to use and it supports most portable MP4 devices.